Impaired Perception in Driving and Sports by Prof. Peter Heilig graphically demonstrates why the neuro-physiological effects of DRL and HID Xenon lights can contribute to accidents. This article published last month in the Austrian Police magazine "Rundschau Polizei Sport" provides the expert medical and ophthalmological evidence we need to send to politicians, lawmakers and auto manufacturers advising that they could be held legally liable for any a accident where blinding by DRL or HID Xenon vehicle lights are cited as a factor. We have sent a copy to Transport Minister Norman Baker appealing him to prevent the EU DRL law being implemented in February 2011. If the Austrian Parliament can ban DRL on 01 January 2008 in defiance of the EU then surely the UK Government can follow suit. To give more impetus to our appeal, please send a copy to your MP asking them to annul the laws that permit auto manufacturers to use dangerous blinding DRL and HID Xenon lights. EU: All 736 MEP's lobbied to annul the Dangerous DRL law. Hi Drivers against Daytime Running Lights! As you know, since 2006 we are ought always to have switched on headlights from 1st November to 1st March (4 months per year). Parking lights are not allowed, they are not recognized as daytime running lights. (For example, I've got a fine for using parking lights instead of my too-bright too-much-energy-consuming full-power low-beam head lights). Bulgarian parliament is about to pass a low to mandate lights on all the time, 365/7/24. There is no specification about the maximum levels of brightness and the idiots who for the sake of "be seen" use their high-beams on full power and their fog-lights during the daytime will continue doing their arrogance. There is no specification about what is a daytime running light and what is not. Everything which is not Audi LED DRL is considered as a light not bright enough as low-beam, therefore is a violation of the law. After mandatory lights what's next? All time running horn?! geringer als im selben Zeitraum des Vorjahres. Die Statistik Austria verzeichnete um vier Prozent weniger Verkehrsunfälle (29.274) und um drei Prozent weniger Verletzte (38.130). 533 Verkehrsteilnehmer wurden getötet, das entspricht einem Minus von cht Prozent. Den höchsten Rückgang meldete die oberösterreichische Polizei: 700 Unfälle und 900 Verletzte weniger wurden registriert. Auch im Burgenland, der Steiermark und Wien ging die Anzahl der Unfälle im Straßenverkehr zurück. Despite representations to the European Commission Transport Commissioner from DaDRL UK, DaDRL USA, European Pedestrians, Cyclists and Motorcyclist Organisations the European Industry Commissioner has mandated Daytime Lights. The UNECE WP29 committee have also ignored our representations and increased the light intensity from 400cd to 800cd and finally in June 2007 to a dazzling 1,200cd. Vienna. The Austrian parliament on Thursday held its final plenary session of the year. On Wednesday 12 December 2007 formal approval was given to a wide range of legislation. The bills included …. The European Commission (EC) has decided not to call for the use of daytime dipped-beam headlights in Europe. This means that the point of view of motorcyclists and other vulnerable road users has finally been taken into account. Transport minister Werner Faymann and Minister of the Interior Gunther Platter announced on Tuesday 11 September 2007 their intention to place an appropriate request before parliament. For the resolution a study, which certifies "light on the day" in bright sunshine has a diverting effect, is responsible. I have another set of numbers from www.Interia.pl (based on FIA report) They introduce the statistics for victims of death for car accidents on European roads (first six months of this year), mainly for those countries require DRL. SPAIN - decreased number of death bringing accidents down by 13%! No DRL required during all year! countries due to daytime the headlights - not only in 2007. SWEDEN - increased number of tragic accidents by 7,3%. Sweden does not even need a comment. CZECH REPUBLIC - since Summer 2006 DRL are required the all year 24/7. Increased number of deaths on the roads almost just like in Poland by 17% ! SLOVENIA - DRL are required outside of the towns like in Italy. Increased number of accidents by 12%. I heard that DRL WILL BE required in Germany Summer 2008! Have they completely lost their minds? Disturbance of the equilibrium of the smooth flow in complex traffic scenarios can be compared with some rather thoughtless human eco-system-interactions in the past. Minor changes may provoke catastrophes and sequences of undesired irreversible failures ('global dimming', climate change, etc.). 'Natural' brightness distribution within visual fields being just one of some prerequisites for the driver's optimized sight, attention and perception. Any accentuation or 'over'-accentuation of stimuli would cause unequal distribution of attention. Consequently some 'accentuated' traffic-relevant objects' Daytime Running Lights (DRL) catching more attention than the less conspicuous objects or 'weaker' traffic participants are creating interference factors thereby disturbing a delicately balanced vulnerable stability. The occurrence of traffic-accidents is probably not reflecting the true potential of induced hazard. 'Near misses' and the avoidance of crashes by preventive driver-reactions just in time may falsify the attempts of expert-evaluations and analysis. The signalling effect of DRL functioning as distracter is only one factor causing imbalance and a kind of non-equilibrium. Side impact- and rear end crashes are indicating the effect of 'imbalance of attention' by accentuating the front of vehicles exclusively (in some countries). All past attempts to increase the conspicuity of pedestrians and cyclists have failed. Reflecting materials appear to be ineffective in connection with DRL. The illumination of bicycles suffers from systematic misconception: With decreasing daylight intensity, front and rear vehicle lights attract the attention of other traffic participants; however cyclists are hard to observe and to detect against a darkening background. The average bicycle illumination does not protect at all against the risk of (fatal) side impacts. Deaths in mixed traffic are avoidable: blinding glare caused by the bluish High Intensity Discharge (HID) headlights can be observed with increasing frequency since the introduction of the experiment (Licht am Tag) in Austria. Additionally headlight misalignment and road undulations cause momentary dazzle. Usually more factors than one are multiplied before the catastrophe of a traffic accident: sometimes a harmless (probably superfluous) traffic sign could be just one distraction too much and provokes cognition failures (overload of the visual short term memory). "Deaths of child pedestrians in Britain rose by 13 per cent last year and child pedal cyclists by 55 per cent, according to the Department for Transport's national statistics on road casualties. The increase was denounced as "disastrous" by the Royal Society for the Prevention of Accidents." 1) DISTRACTERS: moving light stimuli in the peripheral parts of visual fields are catching drivers' attention - provoking eye movements -'failing to see'. 2) CONSPICUITY: less conspicuous TRO's may become sub threshold stimuli for the visual system because of reduced 'signal to noise ratio' compared to accentuated or 'over-accentuated' TRO's (DRL) - again -'failing to see'. 3) PERCEPTION and RECOGNITION: 'Overload' of visual short term memory (VSTM) and disturbance of cognitive processes within visual pathways and visual centres may cause peculiar phenomena*: The image of an especially vulnerable TRO (child at pedestrian crossing) appears focussed and 'crystal-clear' (with sufficient contrast) at retinal level, the visual signal travelling undisturbed along visual pathways, though the visual memory disappeared virtually because of capacity (VSTM) and other functional deficits (cognitive processes) caused by overload (DRL) 'seeing but not perceiving, recognizing' (seemingly 'empty pedestrian crossing'). 4) GLARE: Headlights, misaligned or not can cause retinal adaptation problems, prolonged retinal recovery time (following light 'stress' - 'Macula Stress Test'), especially in elderly or old drivers - worst case scenario: 'Disability Glare'. Resumé: In analogy to Clinical Studies (FDA) results* like the ones described above (and prognosticated) should cause immediate cessation of 'experiments' like DRL in Europe (and worldwide). Continuation of DRL (in spite of better knowledge) appears to be worse than the 'Omission of the Obligation of Protection' becoming more and more a topic of interest in law and jurisdiction. 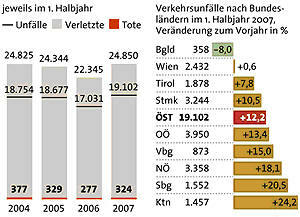 Road-safety figures The Times 11 May 2007 Figures for road deaths were almost unchanged last year. There were 3,150 deaths in 2006, down by 1.6 per cent on the previous year, according to figures published by the Department for Transport. Deaths and serious injuries among cyclists rose to 2,420, the highest for four years. 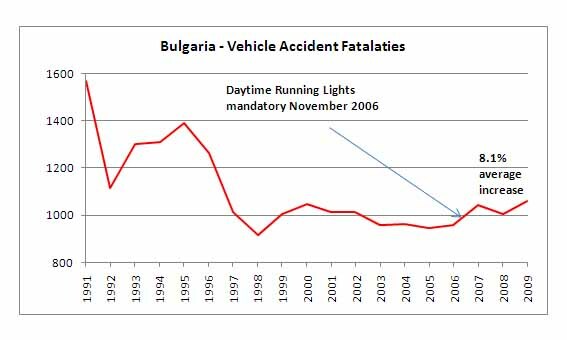 January 2007 was the bloodiest one here in Bulgaria over past 10 years! - since mandatory DRL law November 2006. There is no evidence, that DRL has increased safety on our roads. Motorcycle Action Group UK - dangers to Motorcyclists - "countries that use DRL = NO benefit"
National Motorists Association USA "any person, vehicle, animal, or object without DRL becomes less conspicuous"
Medical Evidence against Daytime Running Lights - reduced hazard perception - "change blindness"
The Times today reports that Roads Minister Ladyman is 'losing the battle' to prevent EU meddlers from imposing 'daytime running lights' on all motorised vehicles across Europe - including the UK. 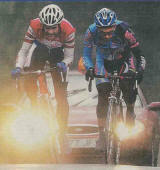 Safe Speed believes that daytime running lights would increase the dangers experienced by vulnerable road user groups. (www.safespeed.org.uk) said: "It is completely obvious to us that making motorised vehicles more visible also makes pedestrians, cyclists and motorbike users relatively - and dangerously - less visible." "I am certain that adoption of this rule would increase casualties amongst pedestrians, cyclists and motorbike users. We must not allow Eurocrats to have such effects on British citizens." "EU harmonisation may be a good idea - but NEVER at the expense of British lives." "We must not trust Brussels with our road safety policy - we must do whatever it takes to protect British road users." The Safe Speed campaign provides free web space to the UK branch of 'Drivers Against Daytime Running Lights (DADRL) and has done for many years. The Safe Speed road safety campaign is primarily the work of engineer-turned road safety analyst Paul Smith. Since setting up Safe Speed in 2001, Paul Smith, 51, an advanced motorist and road safety enthusiast, and a professional engineer of 25 years UK experience, has carried out over 10,000 hours working on the campaign with well over 5,000 of those hours researching the overall effects of speed camera policy on UK road safety. In addition to those 10,000 hours, Paul has funded to campaign to the tune of £10,000. My name is Harry Jennings and I am a police officer in IL. I have been a police officer since '98 and I am one of the most highly trained officers in my area. I would like to take a minute to express my professional opinion on daytime running lights. They are a distraction to many drivers and affect glare. There is no benefit to DRL. They only add to the expense of the vehicle and create yet another maintenance issue. Please, reject any DRL requirement and allow the marketplace to decide if such devices are worth the price. We thought that you might be interested in our response to the commission’s Consultation Paper and enclose a statement of position and short facts. 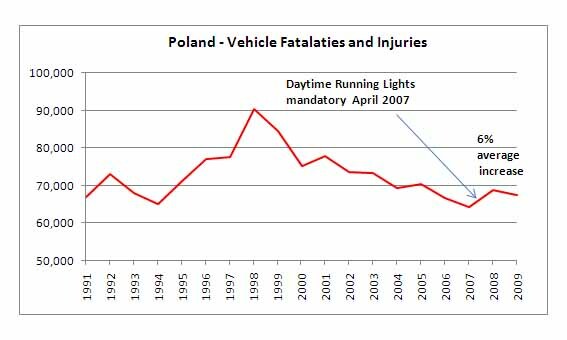 On the basis of flawed methodology, the Commission claim that daytime lights can save lives yet Jacques Barrot cannot produce (DaDRL request 31 March 2005) any concrete evidence of actual reductions in accidents in the countries the already using daytime lights. When introduced into the USA accidents increased. We believe they are a marketing gimmick with one group of drivers cocooned in airbag cushioned impact resistant metal boxes trying to gain pecuniary advantage over pedestrians, cyclists and motorcyclists. Besides polluting the environment, daytime lights increase the danger to vulnerable less conspicuous road users, thus DaDRL are opposed to their introduction. If the Commission really wanted to improve European road safety, why don’t they encourage all drivers to have regular eyesight and advanced driving tests? We hope that you will consider our submission and form you own opinion on the validity of daytime lights. As a veteran and a long career in law enforcement I would like to draw your attention to a peculiar irony in the use of drls. As a way of extracting information from enemies and criminals we used to put people in a bright room and then shine a harsh light on them! And that was the most effective technique we could find to cause the most discomfort in a person, in effect it was torture. The reason it worked so well is that bright glare increases stress level, produces intense discomfort, and is in fact unbearable for any length of time. The technique is now considered inhumane and is no longer allowed. The effect of daytime running lights on a driver is the exact same thing. You have turned the American roadways into a torture chamber where the driver is forced to endure glaring lights in front and behind him with no way to escape. I think we are now beginning to see the effects of this as I read these comments. Every year it seems their are more and more cars with drls and they seem to be getting even harsher and brighter. I would strongly urge whoever is making the rules here to put an immediate end to the use of all daytime running lights. The European Commission launch a Consultation Paper titled Saving Lives with Daytime Running Lights (DRL) inviting responses to tren-e3-consultation@cec.eu.int by 17 November 2006. The EC undertake to publish all comments and hold a meeting. You are just a pack of ratbags. Please keep your stupidity to yourselves. A thin, even layer of the glow-in-the-dark film is applied to bumpers, engine covers and cowlings. Like the phosphorescent materials used on watch dials, the polymer in the film absorbs sunlight and then releases the energy slowly at night to produce a soft glow. The aim is to make small, vulnerable vehicles safer to drive in low-light conditions and the technology is due to be launched on Yamaha’s ECO2 Electric Scooter. Cost will be around $2,000 US approx £1,100. Any 'overaccentuation' ie. DRL in a visual field (especially moving bright stimuli) are attracting attention. The eye is forced to fixate these objects thereby distracting attention from less prominent objects. No 'scientific' study will be able to disprove these facts. Change blindness, inattentional blindness even inattentional amnesia, crowding phenomena, multitask problems, interference of too many inputs worsen the situation additionally. WASHINGTON, D.C. — The National Highway Traffic Safety Administration said U.S. traffic deaths rose 1.3 percent last year, despite record-high seatbelt use, while motorcycle fatalities increased for the eighth consecutive year, this time by 8 percent. It's strange then that DRL have had no benefits. March 2006 Burning headlamps during the daytime can be expensive - bulb change costs of £120 are quoted for VW/Audi cars - other popular new designs also have a high cost. > Running lights over which I had no control almost got me killed once. > I despise them for that and for the distracting glare they present to my eyes and brain. > I am in the process of learning how to disable DRL's on my car now. Thanks for your work. DARK MATTERS: There is united opposition to daytime headlights from UK and EU pedestrians, ramblers, cyclists, motorcyclists and driver organisations. Increased safety is not achieved by lighting a car up like a Christmas tree, putting vulnerable road users at risk. New Scientist have published an article Turned off by Daytime Driving Lights well written and researched by Caroline Williams. It looks at both sides of the argument. "Daytime running lights on anything bigger than a motorcycle are a monument to man's stupidity. Philips Automotive Lighting announce a newly regulated 13 watt lamp for use in dedicated DRL lamps with a maximum of 500cd - see Action Centre / Lighting Manufacturers. The Stockholm Environment Institute in Sweden are investigating the "Swedish Vision Zero road safety policy" for the DfT. Whilst the overall aims to improve road safety are commendable, DaDRL have responded because even their own graphics depict glare and the masking effect of DRL, Vision Zero being a very apt name. Overall traffic fatalities in the US increased slightly last year and motorcycle fatalities increased again for the 7th year in a row. It's been 7 years since the NHTSA opened the 4124 docket for DRL intensity comment. The National Highway Transport Safety Authority (NHTSA) has denied a petition on docket 19529 for a DRL height exemption on the Toyota Lexus LX470 4x4 due to representations by DaDRL members. Previously the NHTSA has denied a DRL exemption on docket 11041 for the Toyota Celica. Ford still do not normally provide DRL on their vehicles. General Motors vehicle sales are low, their stock price is at a 13 year low with bond ratings just above junk status. Please NHTSA, get with the highway safety program that you were hired for and order auto and truckmakers to quit with the daytime headlights. All day long driving my truck, I can see vehicles WITHOUT headlights MUCH BETTER!! They do NO GOOD to help to be seen. But they sure are a distraction and a hazard. Why in the world do trucks and buses need them on for? but those damn headlights should be off till visibility warrants them on. TQ. We have heard that the EU commission intend to mandate DRL within the next 18 months. OSRAM Lighting are actively advising the use of daytime running lights in order to sell more gas guzzling tungsten halogen lamps at http://www.osram.com/products/automotive/lightatday/index.html . We have expressed our concerns to their Chairman Jürgen Radomski and we hope will respond favourably. A similar letter has been sent to Philips Mr. G. J. Kleisterlee President and CEO. Letters have been sent to Jacques Barrot Vice-President of the European Commission and Commissioner for Transport, Andris Piebalgs EU Commissioner for Energy, Prime Minister Anthony Blair, Adrian Burrows DLTR UK, Mr Yoshiji Nogami UK Ambassador of Japan and Tony Juniper of Friends of the Earth. alliance with the motorcyclists groups to combat the spread of DRL. The web page DRL Studies has been redesigned to list Pro DRL and anti DRL studied for ease of reference for press and Google. USA:  The National Highway Transport Safety Authority (NHTSA) have docket number 17243 open for public comment on DRL glare. To view or submit comments visit http://dms.dot.gov/search and type in docket number: 17243. A good system of open government except the NHTSA are mysteriously dragging their feet on a ruling. While it appears that NHTSA has withdrawn the 4124 docket, it's status remains open and people can still post comments to it but 17243 is the later docket. When Motor Manufacturers submit vehicles for the EPA Combined Average Fuel Efficiency tests (or C.A.F.E.) used to determine official fuel consumption, they are not required to use daytime lights.